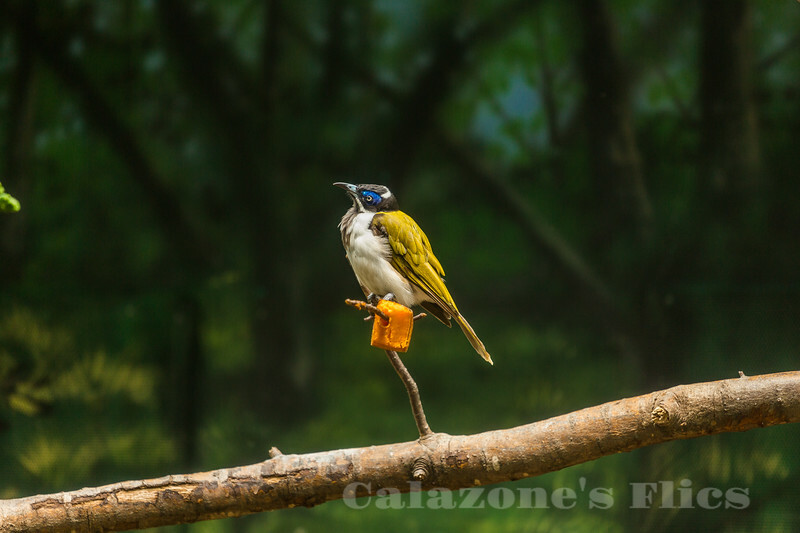 The blue-faced honeyeater (Entomyzon cyanotis), also colloquially known as the bananabird, is a passerine bird of the honeyeater family, Meliphagidae. It is the only member of its genus, and it is most closely related to honeyeaters of the genus Melithreptus. Three subspecies are recognised. At around 29.5 cm (11.6 in) in length, the blue-faced species is large for a honeyeater. Its plumage is distinctive, with olive upperparts, white underparts, and a black head and throat with white nape and cheeks. Males and females are similar in external appearance. Adults have a blue area of bare skin on each side of the face readily distinguishing them from juveniles, which have yellow or green patches of bare skin. Found in open woodland, parks and gardens, the blue-faced honeyeater is common in northern and eastern Australia and southern New Guinea. It appears to be sedentary in parts of its range and locally nomadic in other parts; however, the species has been little studied. Its diet is mostly composed of invertebrates, supplemented with nectar and fruit. They often take over and renovate old babbler nests, in which the female lays and incubates two or rarely three eggs.